Ya Jagoff!!! | Mrs. Brady Wouldn't Say That! Home Football Mrs. Brady Wouldn’t Say That! Mrs. Brady Wouldn’t Say That! If you know ANYTHING about this blog, we typically reserve our posts for people that are making Pittsburgh, or Pittsburghers, look bad. Today is an exception because it’s just toooooooo good to pass up. Yesterday’s post about Tom Brady and Coach Belli-cheat losing another Super Bowl, prompted a couple of followers to hook us up with Tommy Boy’s wife, “Mrs. Brady,” and her comments about his co-workers, the Patriots’ wide receivers, not catching the ball. See! Too good to pass up. 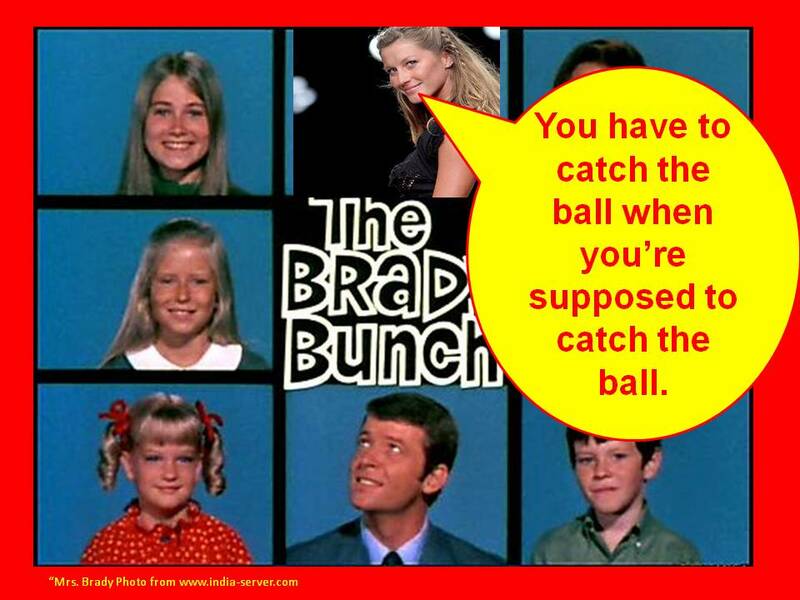 The first thing that came to mind was, the REAL Mrs. Brady, Carol Brady (Brady Bunch fame) would NEVER act that smug to anyone, not even to Marsha in the Brady Bunch episode when she DID NOT catch the football and broke her nose. But back to the topic at hand, Mrs. Brady is calling out her husband’s co-workers??? Can you imagine this happening in the REAL world? Oh boy! All we can say is, Gisele, keep looking good, but until you do at least 8 Madden NFL 2012 marathons and make a minimum of 50 phone calls to Pittsburgh sports-talk shows under some assumed name like “Coach,” “Duke,”or “Scorekeeper,” just keep quiet, Ya Jagoff! And speaking of gaming marathons, don’t forget this weekend’s ChachiPlays fundraiser! Click the icon for details. Previous articleGiants Win! MORE IMPORTANTLY…Brady DOESN’T Win!!!! Hands down the best ‘jagoff’ post ever! I would bet a Primanti Bros. (Sangwich, with egg added), this would go viral on you-tube! Awesome work gentlemen!!!! 5 stars!